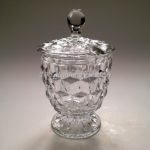 The Fostoria Glass Company made a few Jelly or Jam pieces in the American pattern – one of which was the Jelly and Cover. Looking like a candy dish, many people often classify it as such. 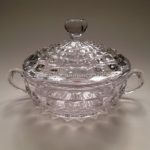 While the Jelly and Cover was originally described and named for serving just that, this beautiful dish will also serve candy and other small foods rather nicely. 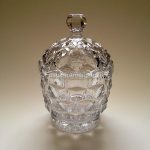 The Jelly and Cover is approximately 6¾” to 7″ in height, and about 4½” in diameter. It is one of the pioneering pieces in the line, debuting in the first Fostoria American 1915 Catalog Supplement. 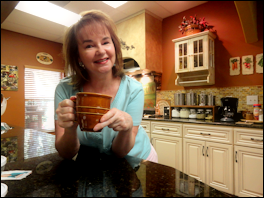 With an amazing production life, it was still being manufactured right up until the early 1980’s. 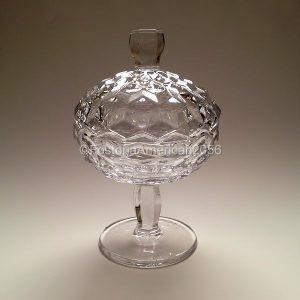 Back when this piece was first introduced over a hundred years ago, serving jelly or dessert in this type of glassware was very popular – especially in the 1800’s – and for years thereafter. 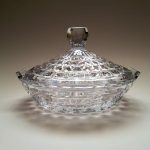 While most households no longer serve jelly in this fashion, the Jelly and Cover was, and still is, an important piece in the history of the American line. 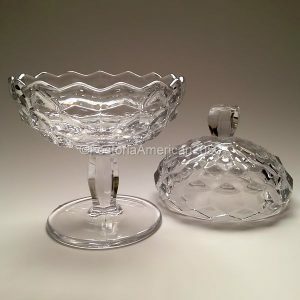 Please click the following affiliate link for available Jelly and Covers on eBay. 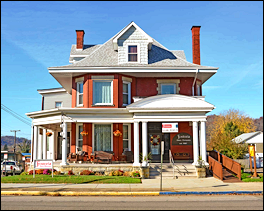 This is a beautiful piece of Fostoria American that you can buy quite inexpensively – even today.